The Flames Real Starting Goalie? 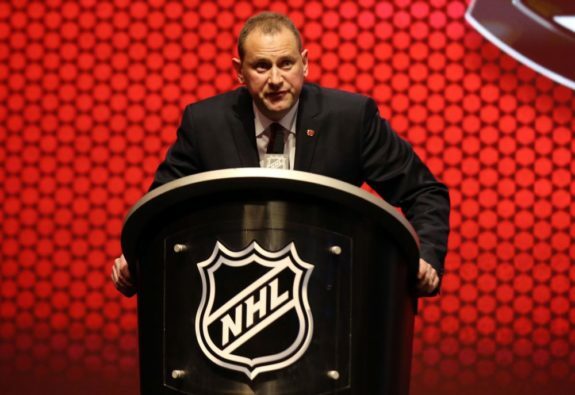 Following a season in which the Calgary Flames had a league worst goaltending performance, general manager Brad Treliving set out on improving the position. Treliving was successful in doing so, acquiring two upgrades at goaltender before the 2016-17 season. 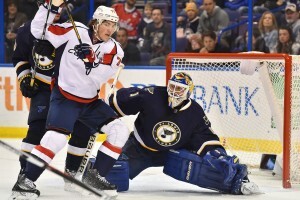 The first move was acquiring projected starter Brian Elliott from the St. Louis Blues for a second-round draft pick and a conditional third-rounder. Not stopping there, Treliving would shore up the backup position by signing Chad Johnson on July 1. After suffering through a season of sub-par goaltending, Flames fans were given what they had craved all year long. Elliott also received an opportunity to get what he had fought for so long for in St. Louis — a secure spot as a starting goalie. Just 22 games into the season, Elliott is letting his opportunity slip away, and the Flames find themselves with yet another goaltending dilemma. Coming into the season, there was no doubt Brian Elliott was going to own the crease. His performance between the pipes over the last five years has been nothing short of spectacular. Posting a combined save percentage of .925 and a goals-against average of 2.01, there were no questions about performance. The only slight concern was if Elliott would be able to handle a full workload, as he had only averaged 36 starts per season over that period. That’s where Chad Johnson came in. Starting 40 games for a below average team in Buffalo, Johnson still put up excellent numbers. Johnson posted a .920 save percentage while maintaining a 2.36 GAA. With an added bonus of being a hometown kid, Johnson was the perfect backup for the Flames’ new starter. To date, things have not worked out as planned. Elliott has not looked like himself to start the season and his numbers are a shell of what was expected. Through 10 games, Elliott has posted a paltry .882 save percentage and 3.43 goals-against average. Of the 50 goalies that have played five or more games to date, both of these numbers are good enough for 47th place. The result? A record of 3-9-0. The highest loss total and 44th worst win total of the same qualified group. Unfortunately, these kind of numbers are giving Flames fans flashbacks to last year, and are not good enough to help his team win hockey games. On the other hand, Johnson has seized the opportunity to shine. In his 10 starts, Johnson has lived up to last year’s numbers and more. The tender’s 2.08 goals-against average and .922 save percentage put him at 16th and 12th respectively in the same group of qualified goalies. Johnson has also posted two shutouts, matching his career high already. As one would expect, the better goaltending performance has put the Flames in a better position to win, leading to a 6-3-1 record. With the history of great performance from Elliott, his numbers just don’t seem to add up, especially in comparison to Johnson’s. This early in the season, fatigue shouldn’t be an issue, so why the swing? One logical path to follow would be the chances a goalie is facing and their quality. All shots are not created equal, and Corsica provides a breakdown of how each goalie has performed based on whether a shot is a low, medium, or a high danger opportunity. When a goalie transitions to a worse team in the standings, a common thought is that a lesser squad will allow more frequent scoring chances for the opponent exposing potentially weak goalies. Examples of this are out there (just ask the Edmonton Oilers) and they will continue to happen in the future. This is a theory that would prove concerning with Elliott, but add hope with Johnson. Where this theory loses merit for the Flames, however, is that despite being on the better team, Elliott was still being exposed to more high danger shots per game last year than Johnson. With number one between the pipes, the Blues allowed 4.667 high opportunity chances per game compared to the 4.244 that Johnson was facing with Buffalo. Elliott also had a higher save percentage on these opportunities, saving 86.22% of his high danger shots, where Johnson was only at 79.58% in the same category. Logic, therefore, would dictate that Elliott would have a lesser adjustment to more high danger opportunities. Unfortunately, that hasn’t been the case. 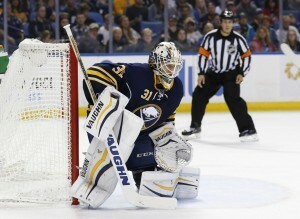 This season he has seen his high danger save percentage from last year take a significant 11.22% dive to 75%. Johnson has also seen a decrease in his high danger save percentage, but by a much smaller 1.32%. Another line of thought is that the team simply hasn’t played as well in front of Elliott as they have for Johnson. According to the types of shots given up, the data does support this theory to an extent. Although the medium danger shots are relatively similar, Elliott is facing, on average, 1.4 more high danger shots per game. Those 1.4 shots per game are coincidently only slightly more than the separation in goals against average between the two keepers (1.35). Combine the high danger opportunities and the lesser performance from the ex-Blues netminder, and the result is him finding himself with the clipboard and Johnson in the blue paint. Taking all of that into account, the question remains if Elliott has lost the starter’s role only a quarter of the way into his first season with the Flames. Despite all the numbers, the Flames need to win now to keep any postseason hopes alive. The best way to do that is to ride the hot hand. If one of the two goalies is putting up wins, whether it’s the result of a better performance, a more confident team in front of them, or just good old-fashioned luck, that’s the goalie they need to roll with. Right now, that’s Chad Johnson. This may mean that the label has temporarily fallen off Elliott, but by no means it’s gone for good.